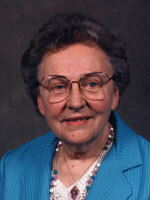 Verna B. Flower, 92, formerly of Lancaster, passed away Thursday, Aug. 16, 2012 at her son’s home in Arlington, VA. She was born in Gap, the daughter of the late Rev. Omar and Ada Ranck Buchwalter, and was the wife of the late Rev. George E. Flower. Her life was one of love for, and service to the Lord Jesus Christ, as a young girl in church, a Pastor’s wife, and an Executive Secretary in the national office of the Assemblies of God. She was an accomplished vocalist, an avid gardener, and a person of great creativity, making quilts, afghans, ceramics, etc. as gifts of love to her family. Surviving are: a son, the Rev. Roswell T. Flower and wife Sandra of Arlington, VA; a daughter, Elizabeth Quayle and husband Thomas of Richland, WA. Preceded in death by three brothers and five sisters, she was “Grandma” to eight grandchildren and sixteen great grandchildren. A committal service will be held at the Strasburg Mennonite Cemetery 1514 Village Road Strasburg, PA on Saturday, September 8, 2012 at 10 a.m. A memorial service will be held at the Victorian Chapel at Willow Valley 2416 Willow Street Pike Lancaster, PA 17602 on Saturday, September 8, 2012 at 11 a.m. The family will visit with friends immediately following the service. In lieu of flowers, contributions may be made to the George E. Flower Memorial Scholarship fund, Valley Forge Christian College, 1401 Charlestown Road, Phoenixville, PA 19460.